Felix Desjy's success in the G1 £100,000 Betway Top Novices' Hurdle was trainer Gordon Elliott's second win of the day, following Three Musketeers in the opening Merseyrail Handicap Hurdle. Both were well-backed and it was a 39.5/1 double for the Co Meath trainer. 7/2 shot Felix Desjy, owned by Gigginstown House Stud and ridden by Jack Kennedy, made most of the running in the two-mile race and survived a bad blunder at a hurdle halfway round to win by a length and a half from 3/1 favourite Aramon (Willie Mullins/Ruby Walsh). Elliott said: "We thought he'd like the track here today, and Jack was good and brave and let him stride along, and if he'd got beaten for doing that, he wouldn't have been getting the blame. Maybe he got a bit of a freebie, but that's the name of the game. Jack used his initiative and that's why we use these lads. "I thought we might be in trouble after he made that mistake, but in fairness to the horse, in the last 50, 100 yards you couldn't fault him - he picked up and went on. 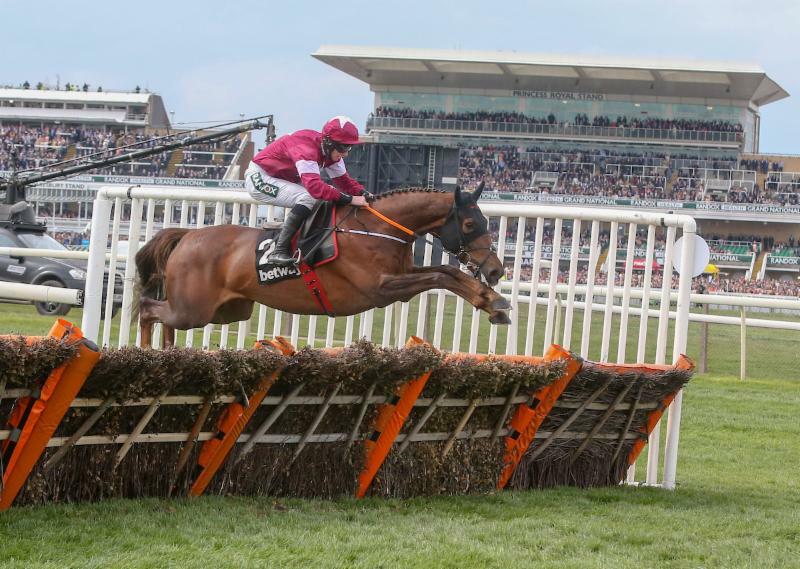 "I thought when he won his maiden hurdle he was good, and maybe it's hindsight but I'd say we were riding him wrong [when he was beaten since]. "Chasing is going to be his game, but this was a great run. Jack knows the horse at home - too many instructions would only complicate it." Supreme Novices' Hurdle fifth Felix Desjy (7/2) survived a bad blunder at the first hurdle down the far side to make all and hold the Supreme sixth Aramon (3/1 favourite) by a length and a half in the Grade 1 Betway Top Novices' Hurdle. The six-year-old's success put jockey Jack Kennedy top of the Aintree jockeys' table following his success in the opening on Three Musketeers. He has Dounikos to look forward to in Saturday's Randox Health Grand National, plus disappointing Champion Hurdle favourite Apple's Jade in the Ryanair Stayers' Hurdle. Kennedy said: "Daryl Jacob (Rouge Vif) wanted to be forward too, but I let my lad rock and roll down to the first and Daryl was happy to leave me off. It worked out well. "He was very lucky at the first down the back but to be fair to the horse he did well to have the scope to get there from where he came up from. I was still happy enough turning in as he stays further than two miles and so I was confident he would keep going, but coming to the last I could hear Aramon coming. He dug deep though and kept going all the way to the line. "He missed the kick in Cheltenham and actually ran a blinder there. I think the sharper track today played into his hands." He added: "He's always had plenty of ability but we've been waiting for things to fall right for him. You probably won't see the best of him until he jumps a fence." Willie Mullins hopes Faugheen will be given a check over at Leahurst Equine Hospital in Liverpool following his run at Aintree yesterday. The gelding was pulled up during yesterday's G1 Betway Aintree Hurdle, and it was subsequently reported that he had an irregular heartbeat. Mullins said: "He was grand last night, but I will try to get him to the hospital this afternoon for some tests. Otherwise, if they are unable to take him we'll get him home and check him over there. His heart had an irregular beat, but it's something that can correct itself within a few days. It's a regular enough occurrence and not complicated from what I can gather." The trainer was talking following the running of The Betway Top Novices' Hurdle in which his Aramon (3/1f) finished second to Felix Desjy (7/2), beaten one and a half lengths. Felix Desjy made all the running. Mullins said of Aramon: "He ran well in the ground conditions, and full credit to the winner, who did it the hard way. We've run well to be second and I'm pleased enough. "We thought there would be plenty of pace and that they would come back, but one didn't, and that's the way it goes. The horse ran his best." Aramon races in the colours of the Supreme Racing Club and Michael Songer. Mullins said of the Club: "They might have 30 to 35 horses with me, and horses for every budget. They lease and buy horses and are a good group of people. "This horse will now go on to Punchestown." Harry Whittington is looking to the future with Rouge Vif (9/1), who finished a creditable third to the Gordon Elliott-trained Felix Desjy (7/2) in the G1 Betway Top Novices' Hurdle. Ridden by Daryl Jacob, Rouge Vif tracked the winner throughout the two mile and four furlong event before tiring late on. Whittington was delighted with the performance and he said: "I'm happy with that run from Rouge Vif. "I was gutted the rain came as I would have loved to run him on good ground or even good to soft, good in places. He is a very good-actioned horse and his best form is on better race. "Rouge Vif has run a monster and he just tries so hard. He has given everything today and that is a career-best. "He is a big unit of a horse and he is only going to strengthen up more - he will be exciting to go chasing with. "We'll let him tell us in the next week or so before deciding if he runs next year. He is only going to get better with age as he is still only five and on the weak side. Once he fills into his frame, he will have an exciting future. "We could go chasing next season, but he is a horse we are really excited about going forward."